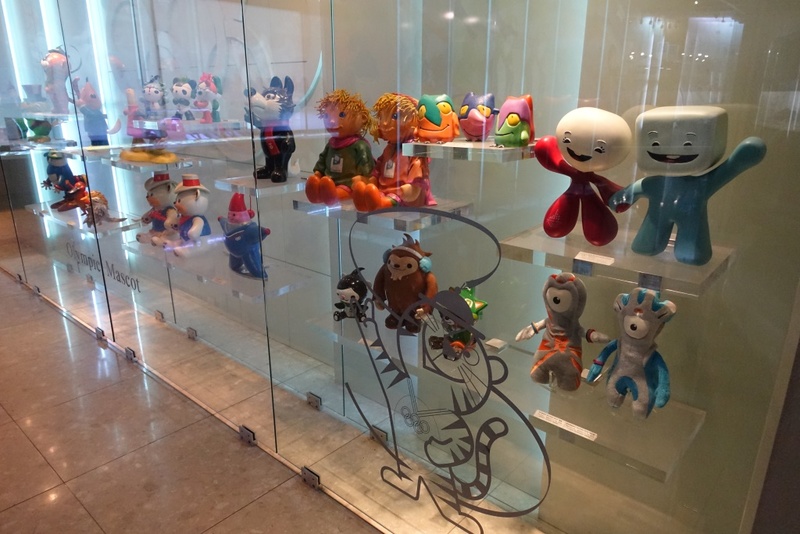 The first full day in South Korea was a designated for rest and recharge, with a block of hours also set aside to explore the nation's Olympic past. 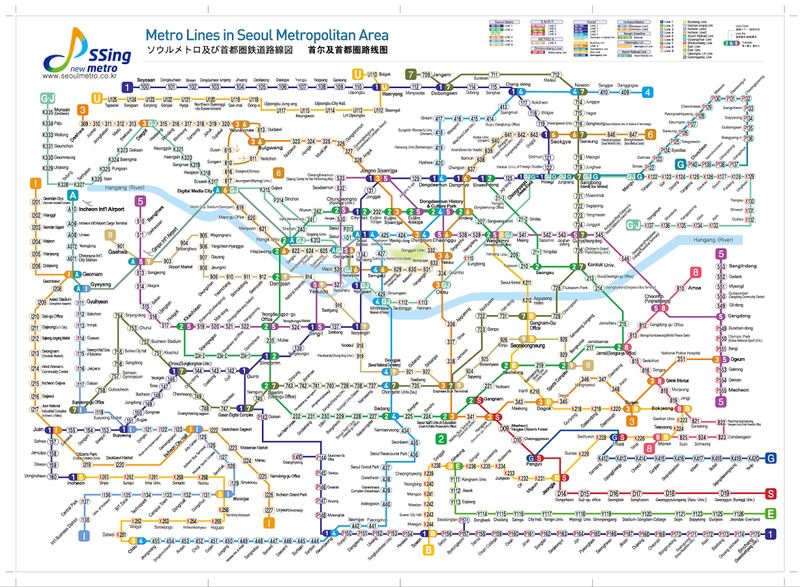 I also awoke determined to tackle the Seoul subway system, which resembles a multicolored plate of spaghetti with one light blue noodle (at about the 9 o'clock part of the plate) loosely unfurled eastward to ICN airport. After a restful night at the Hotel Parkwood (a few kilometers from of Terminal One via elevated train), I returned to the airport to get directions for the rest of day and week. First stop: the Avis counter. 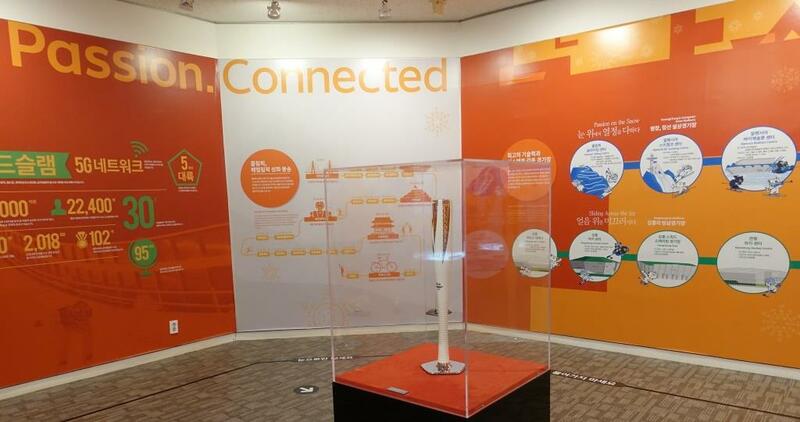 Up until this visit, I thought this 23-day winter Games experience might include a rental car and driving. However, staggering prices and a bit of anxiety -- fueled by conversations with fellow Americans who've attempted driving here in the past (universal "don't do it!" advice) -- combined and led me to throw in the Avis towel, now set to roll the dice with public transportation. Fingers crossed the speed train and Olympic shuttle system will serve my needs starting tomorrow. Prayers welcome! In spite of the morning's rental car hemming and hawing, the set plan for this afternoon all along was to take the Seoul Metro into the city to explore the 1998 Seoul Olympic Park and museum. My God, I had no idea how big this city go on and on and on! The two-hour urban journey -- on what proved to be a very clean, safe, remarkably efficient and easy-to-navigate subway -- was worth the time taken to trek round-trip (about 4.5 hours with walking and wait-times). It was cool to figure out the transfers from light blue to brown to the purple line (a welcome relief). Upon exiting the metro station on the south end of Olympic Park, my weary traveler eyes at last caught sight of the massive Peace Gate constructed 30 years ago. 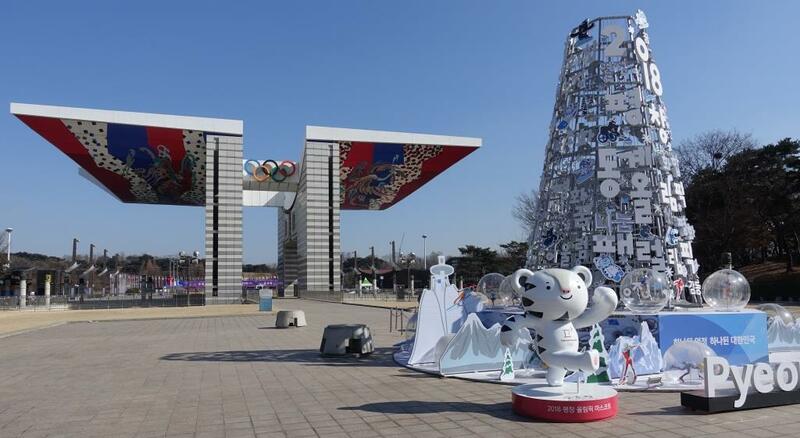 Since it was a bitter cold winter work day in the city, the handful of pedestrians entering the park barely outnumbered the security and staff on hand to manage an outdoor skating rink, likely a "live site" for viewing the PyeongChang 2018 Games once they commence on Friday. 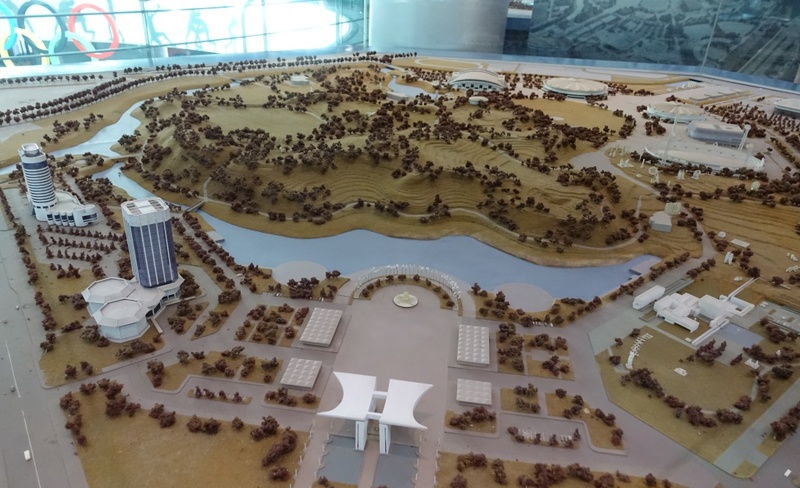 Only a few steps from the gate I found Seoul Olympic Museum, which fills the two lower levels of a midsized building. It was cool to discover the hand- and foot-prints of South Korean Olympic heroes cast in bronze to create a walk-of-fame approach to the museum's front door. Inside -- Boom! 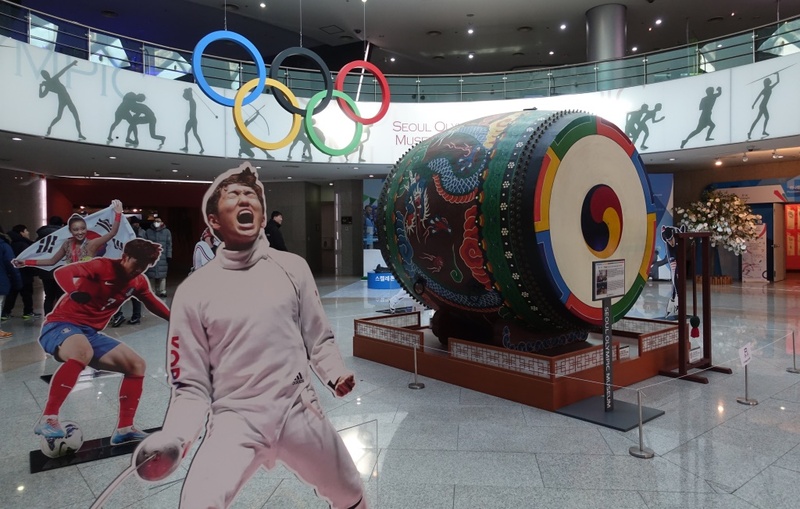 Right there in the lobby visitors discover the massive drum that summoned the heroes of the 1988 Olympiad during that year's opening ceremonies. Guests also enjoy a look at the history of the Olympics (nice displays of historic sports gear and Olympic pins from as early as 1936), with a level-two series of galleries delving into Korea's winning Olympic bids, key moments from the 1988 Games, legacies of the Olympics presented in detail, full-sized models of the Olympic Park and nearby site for the 1988 Olympic stadium, and many displays of Games-time souvenirs or official gifts presented to the Olympic Village mayor 30 years ago. The museum also includes a modest gift shop (lots of pins but not one for the museum itself nor for PyeongChang 2018), an Olympic studies center and a massive 5-D Theatre in which guests may "race" down an Olympic bobsleigh, ski jump or downhill course with wind in rider's hair (the ride simulation vehicles seat about 30 passengers, much like rides at Universal Studios or Disney World). 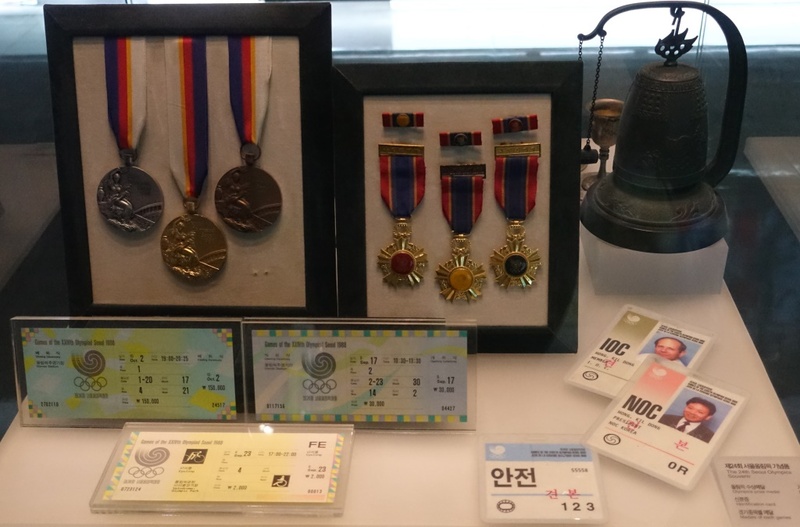 For me one of the most interesting and poignant items on view regarded 1936 Olympian Sohn Kee-chung, who was the first Olympic medalists from Korea but forced to compete as part of Japan, which occupied the Korean Peninsula during the Berlin Games. 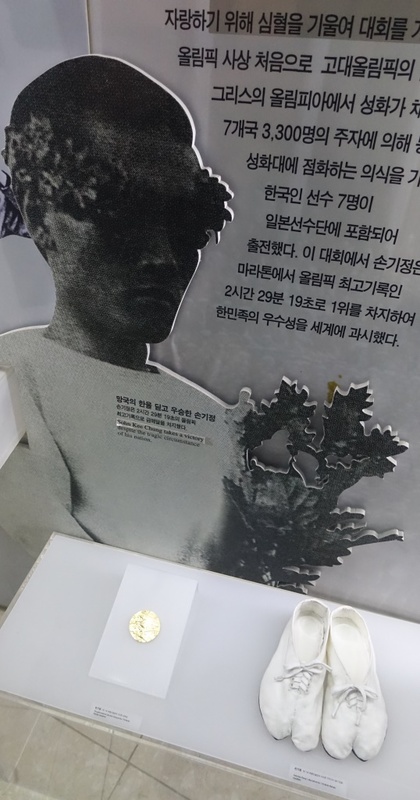 Decades later, the marathon runner (whose unique toe-contoured shoes are on view in the museum) carried the Olympic torch into Seoul Olympic Stadium. 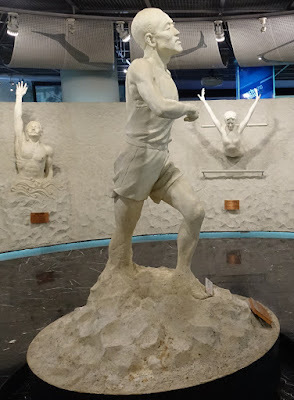 A life-sized statue of Sohn Kee-chung is encircled by ceramic busts of other Olympians of the ages. 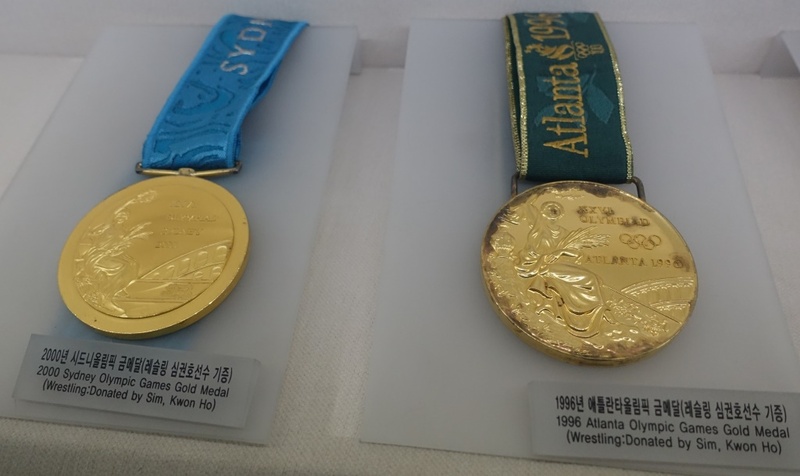 It was also interesting to see the two gold medals won by Korean Olympic wrestler Sim Kown-ho at Atlanta and Sydney. Upon exiting the museum it was fun to check out the park's collection of more than 100 large outdoor sculptures, but a huge bummer the SOMA Museum of Art was closed to take down a recent exhibition. Next time, right? The rest of Tuesday was all about food. On the recommendation of a fellow American met en route to Seoul, I detoured to the international district of Itaewon in search of an Alabama-inspired joint named Linus' BBQ, and man, was it tasty! Yes, I know -- travelling half-way around the world only to eat food from back home defies logic, but after three days of South Korean cuisine, which I find to be universally delicious, I did crave some fried okra and Linus' delivered the goods, all tucked away in an off-alley hole-in-the-wall that was packed with locals. Later, back near the hotel, also snacked on lightly-fried seaweed chips purchased at a pop-up food vendor's stand in one of the metro stations, found a new favorite coffee drink, and took-in dinner at a family-owned seafood restaurant that served the best steamed oysters and mussels with vegetables and colored noodles in a delectable steaming broth. 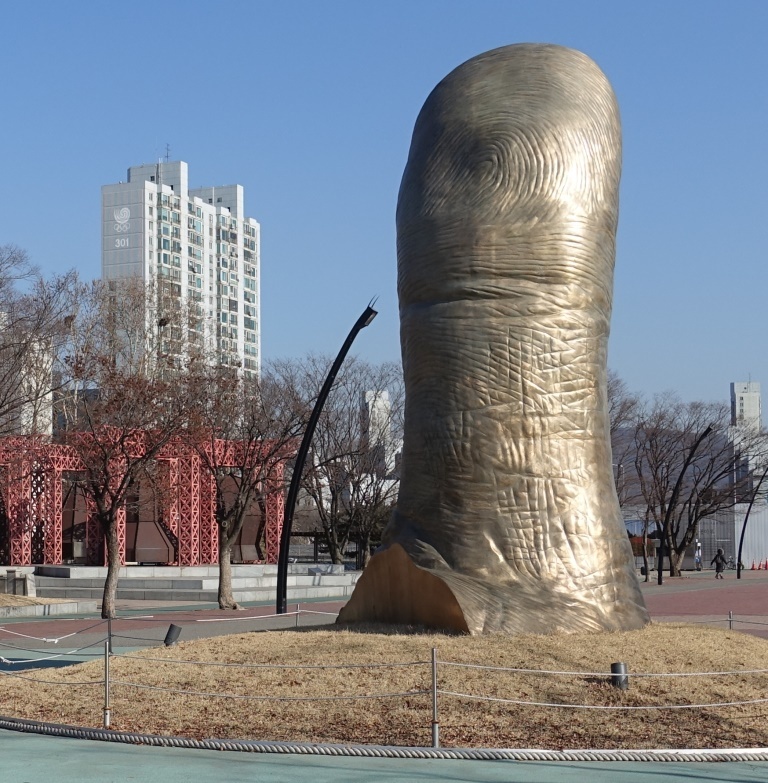 Here we go again with the Seoul spaghetti! Great post. 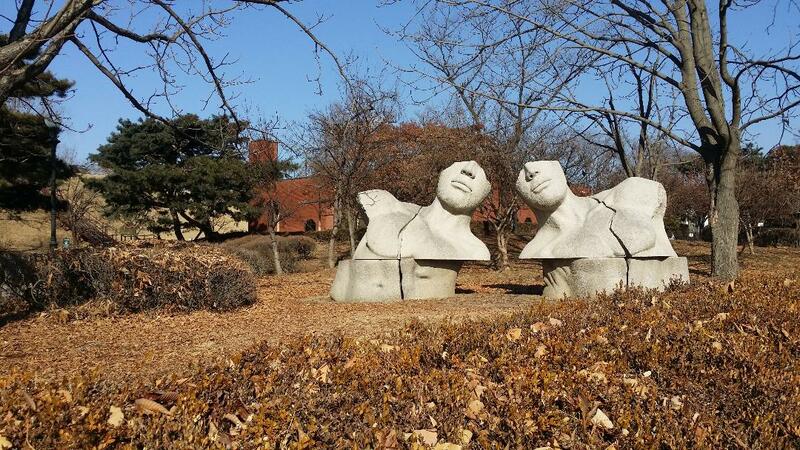 Love your Pyeong Chang blog. Good job.